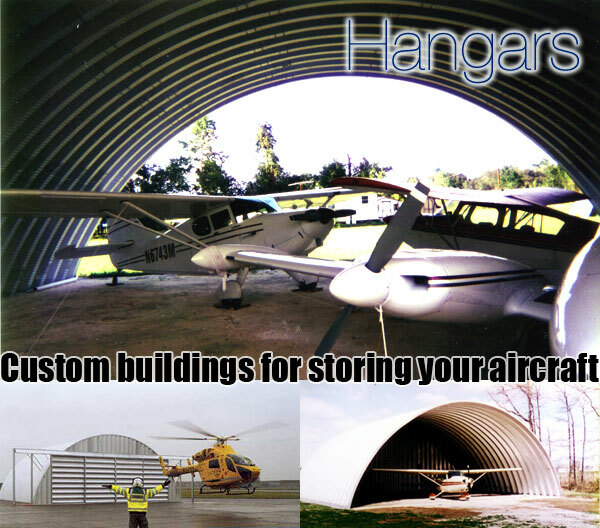 Archcore steel buildings are the ideal solution for personal and commercial aircraft and helicopter storage. Our buildings are designed for the do-it-yourselfer, and an ideal steel hangar building on a tight budget. Archcore steel hangars are well known and respected for protecting your valuable aircraft against the snow, fire, and hurricane force winds. Backed with a 35 year warranty and manufactured in the United States, they are designed to last! Our aircraft hangar steel buildings have a clear-span interior which allows for 100% of usable space in the interior. There are no posts, trusses or beams in the way allowing you to store and maintain your expensive investments in aircrafts with ease and still have room for extra workshop or storage area. There is absolutely no place for rodents or birds to hide or perch to create a mess as there are no trusses or rafters. The efficient design of Archcore's steel airplane hangars means clear-span widths of up to 140' and lengths that are unlimited. Since our pre-engineered aircraft storage buildings have superior strength they can be left open on one or even both ends if your application requires it. Need only shade cover to get your airplane out of the baking sun? No problem, just leave the ends open. You can always come back at a future date and enclose the ends. Archcore looks forward to helping you protect your valuable investment with the most durable, cost effective, durable American-made quonset building on the market.